Here is a great London Guardian article by Benjie Goodhart about this little-known sport that you can practice almost anywhere, any time. I just excerpted the first few paragraphs. Tower running—racing up the stairs of skyscrapers—is a fast-growing new sport. It is also incredibly painful. Why is it so popular? The agonies people are prepared to inflict upon themselves in the name of fitness and fun are often baffling, but “tower running” takes endurance to a whole new dimension. It is a sport of few rules: you run up a skyscraper’s stairwell, you collapse and the fastest time wins. Despite the fact that it sounds about as enjoyable as gargling with magma, it is one of the fastest-growing sports in the world. In America, there are countless competitions, with the three majors being the US Bank Tower in LA, the Sears Tower in Chicago and the Empire State Building in New York. There are races, too, all over Europe, Asia and South America, though none yet of any significance in Britain. The elite athletes who pioneer this new craze are, unsurprisingly, a rum bunch. There’s 55-year-old Kurt Hess, who holds the world record for altitude climbed in 24 hours (30,000m) and who trains for 12 hours a day at weekends. There’s Ed McCall, a successful broker, who liked running up stairs so much he introduced his teenage sons to it: the three now combine school and work with traveling to races all over the world. And there’s Tim Van Orden, who feels compelled to break records in a host of athletic endeavours, and to show the world (via his website runningraw.com) that all of this can be done on a raw vegan diet. Their motives for taking up the sport may differ, but tower runners all talk of one universally shared experience – the pain. “It’s not all that pleasant,” says Ed McCall. His son, Colin, adds: “After my first race, I puked in a garbage can. Everyone high-fived me.” “Think about the most painful thing you’ve ever done, then multiply by 10,” says his elder brother Colin. Forget the running of the bulls. 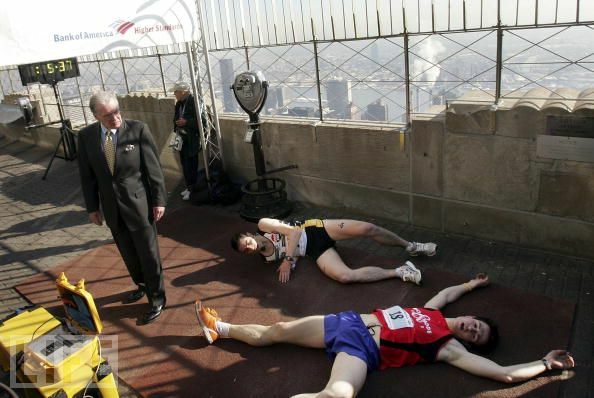 Today was the 34th Empire State Building Run-Up, a vertical quarter-mile. The race, among the first on stairs, began as a lark in 1978. By 2010, there were more than 160 staircase races in the world—on 5 continents and in 34 states. 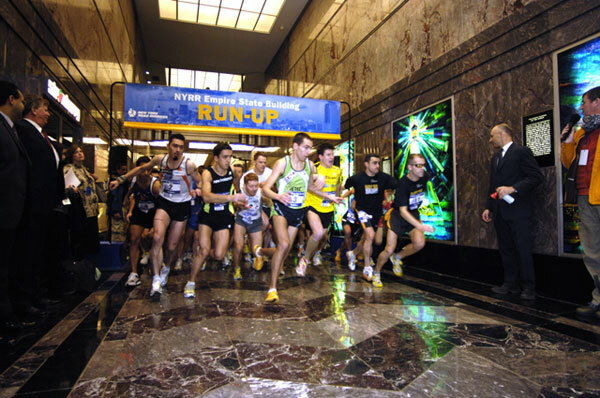 In this year’s Empire State Building race, about 450 runners will depart in seven waves. Strategy is highly individualized, too. Most use the railings as a hoist. And the best racers take the steps two at a time. The longest is in Radebeul, Germany, a 39,700-step, 100-lap slog designed to approximate an ascent of Mount Everest from sea level to the summit. The longest single-staircase race is the Niesen Treppenlauf, in Switzerland, a scenic thigh-screamer comprising 11,674 steps adjacent to a funicular with spectacular Alpine views. Chicago hosts the three longest nonstop run-up races in the United States, and Terry Purcell, 40, has won them all multiple times. I love that word. Of course as we saw a few days ago, you could always run in Antarctica to impress your running buddies. You are currently browsing the archives for the tower running category.